Closes Friday, 8 February 2019. The Australian Industry and Skills Committee (AISC) has commissioned the review of one qualification in the TLI Transport and Logistics Training Package – TLI50316 Diploma of International Freight Forwarding. This project will address the regulatory reforms concerning International Freight Forwarding. Regulatory changes to Biosecurity are required to be incorporated into the qualification and Units of Competency, enabling the compliant shipping of Australian goods to countries around the world. These changes require shippers to utilise new documentation and processes, ensuring shipped international freight meets Australian and international regulations. 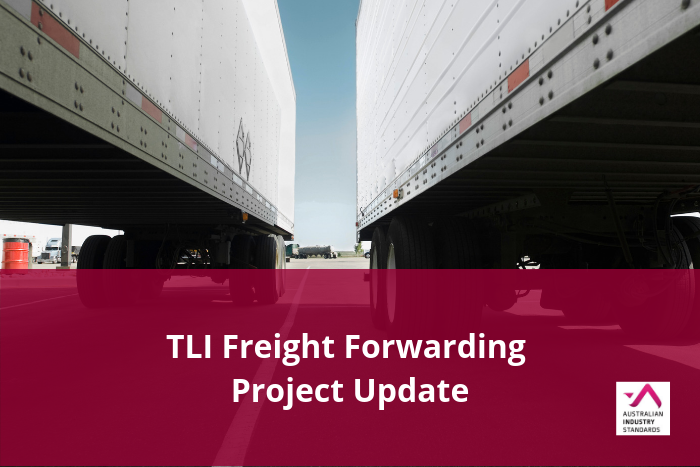 The Freight Forwarding TAC has finalised draft Transport and Logistics Training Package materials for this project and would like your feedback. Click here to view the draft qualifications, units of competency and to submit your feedback. Feedback is open for submission up to close of business Friday, 8 February 2019.